For the past two days, I’ve had an intense compulsion to read something by Henry James. My first response was to lie down and hope it went away. So I watched Wings of a Dove for the fourth time. That wasn’t enough. Today I searched Netflix for more film adaptations of James’ work. Most are on DVD rather than streaming, so I watched The Bostonians for the second time. My yen for James remains. What to do, what to do. My objection to James isn’t that he, as Mrs. Henry Adams observed, “chewed more than he bit off,” but that I can’t always tell what he’s chewing. James is subtle. I am not. One possibility remains: Instead of wanting to read Henry James, perhaps I just want to read something containing compound-complex sentences. Whose compound-complex sentences, I don’t know. Not Edith Wharton’s. Not William Dean Howells’. Not E. M. Forster’s. But I’m going to do my best to find out. Because I have a feeling that after I finish with Henry, I’ll move on to his brother William. A Pluralistic Universe. An American lit. professor recommended it to me. After I’d read Varieties of Religious Experience. In 1972. I’ve never gotten around to it. What a shame if I were to open a book and accidentally engage a brain cell. At least not until cooler weather. My professor said A Pluralistic Universe is mind-boggling. I’d not thought about audiobooks. And listening them overnight is a wonderful idea. I’ve got to look into it. That would be an excuse to buy an MP3 player, right? I tend toward Dickens or Dostoevsky when I want complex sentences. Just sayin….. I don’t feel quite like Dickens now. And the Russians–that’s more than I can do at this time. All the characters have at least three names, and it takes such toil to remember who is who. 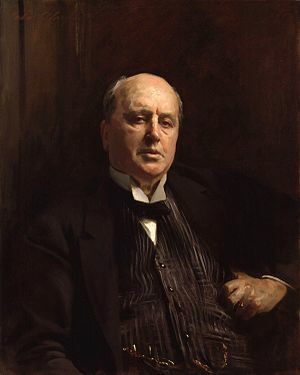 Of course, with Henry James, you have to remember what it what, and I guess that’s not too much different.